Matthew McConaughey's Year Of Acting Dangerously At the very least, fans will remember 2012 as the year the rom-com star revolutionized his career. McConaughey stars in five different independent films, tackling smaller, character-actor roles instead of the suave leading man roles we've come to associate him with. This may be the year of actor Matthew McConaughey. At the very least, fans will remember 2012 as the year that McConaughey revolutionized his career. He's starred in five different independent films, taking on smaller, character-actor parts in place of his usual roles as the sly-grinning heartthrob in romantic comedies. In some ways, the shift is a return to where McConaughey's career first began in the 1993 independent film Dazed and Confused. He played the slightly cheesy ladies man Wooderson in the movie, and he says he got the part after striking up a conversation with one of the movie's producers in an Austin, Texas, bar. "Cut to three-and-a-half hours later, we've been kicked out of so-said bar," McConaughey said. "And he said, 'Have you ever acted before?' And I said, 'Well, I mean I was in a Miller Lite commercial.' And he said: 'There's a role in this film you might be just right for. Come to this address, and pick up the script if you're interested, and come tomorrow morning.'" McConaughey did, of course, and that film launched his career. But after coming to dominate the romantic comedy genre, he started rejecting those scripts and decided to take a break from acting entirely in 2009. He tells weekends on All Things Considered host Guy Raz about that break, what drew him back into acting and what he sees himself doing next. McConaughey and Zac Efron play brothers in Lee Daniels' 2012 film The Paperboy, based on a novel by Pete Dexter. The film played at this year's Cannes Film Festival. "I was like, 'Let's just hold off, McConaughey. Let's sit back and see if something comes and intrigues me that I do not feel like I could do tomorrow — that I feel like I could do it, but I got to go to work and figure out how I can do it. "And as the world works in that wonderfully cyclical way, I started to attract exactly what I was looking for. I met with Richard Linklater about Bernie [a 2011 film also starring Jack Black and Shirley MacLaine], and I get a call from William Friedkin and we have a meeting. "Steven Soderbergh calls for the first time, Lee Daniels, Jeff Nichols. However that works, it was about a year-and-a-half or two-year period, and these were the things that I was attracting. Very independent and singular-minded directors and very singular-willed characters that were — no placation or pandering to society or anyone's rules, really, but their own." In 2012's Magic Mike, McConaughey brings a subtle, frightening darkness to the role of a strip-club owner with a sizable sleazy streak. "It made me get a little quizzical when I first read it. Then pretty quickly after I gave it a sly eye I kind of chuckled and said, 'I'll take that as a compliment.' A lot of people, they go, 'Well Dallas plays the congas, and that's a callback to 1999 when you were arrested in your birthday suit.' And I never thought of it like that ... objectively, people are going to see Dallas playing the congas and they're going to go: 'That's McConaughey in full regalia. We know that about McConaughey.' And that's a nice wink." "I read it and I did not get it the first time I read it. I actually thought it was despicable. I remember throwing the script in the trash and saying I don't want to be any part of that world. "The second read of this, I found myself finding the small chuckles. I started to laugh kind of hard in places. And that was the light that revealed the humanity of the character for me, and also the meter of [Pulitzer Prize winner] Tracy Letts' writing." "I wouldn't say I'm done with the romantic comedies. But what I'm doing right now, I'm feeling the experience of the work. The last five films, which I did back-to-back-to-back-to-back-to-back, I didn't have one day where I even had 60 seconds of complacency. "Every single day, I'm fortunate to say I got out of bed a little nervous and very excited about the work at hand. I never got bored. That's a goal to get there that does not happen with all the characters I've ever played, but that's always been the goal. And that was the goal that I learned from the very first film I ever did, Dazed and Confused. I've been able to have that feeling. 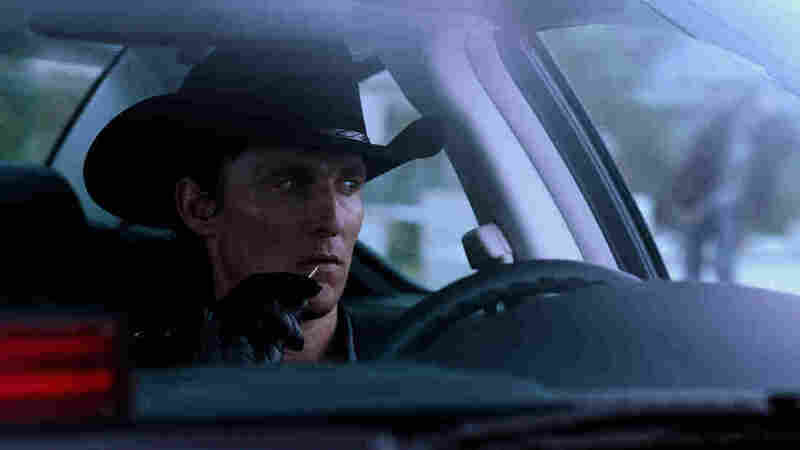 I had it with "Killer Joe." If I can work to get to that place and find characters where I can understand the identity as well as I've understood the identity of these guys I've been playing, that would be just peachy."